Support for Jordie Miller doesn’t seem to be wavering, not anytime soon. This seemed to be the general sentiment at a recent fundraiser to help Jordie Miller, a 25 year old man who is focused on his slow motor skills improvement and increased quality of life. In 2012, after three strokes and their debilitating consequences, armed with a positive outlook and despite his doctors’ dark prognosis, Jordie Miller left the hospital, prepared to face years of rehab that will enable him to regain minimal mobility. His devoted parents are faced with the critical need to purchase a new van with a better lift to facilitate and ease the complex and difficult loading and unloading of Jordie and his wheelchair. The new van will cost $45,000. With much support and caring concern, “Wheelin’ for Jordie” is a fundraising campaign that was created to increase exposure to the Millers’ urgent need. Last Saturday, February 21st in Millet, a Bottle Drive took place within and right across the road from The Old Bank, Evelyn’s lovely café. At the last minute, the ‘Berta Boys/Berta Babes’ Truck Club members spread the word among their Facebook public group and drove from various corners of Central Alberta to Millet to get together and donate bottles to Jordie’s fundraising bottle drive. Evelyn, a big-hearted community supporter, loaned her BBQ to the event. A tin box on the deck received donations for these delicious hot-dogs, while more cash was dropped off by members arriving on site. The continuous flow of trucks and other vehicles arriving on Highway 2A to deliver huge quantity of bottles was truly impressive. After the bottle drive, a spectacular lineup of 26 trucks drove to Wetaskiwin to meet Jordie’s mother, when the Club’s members collectively handed over close to $4,000. Many Wetaskiwin residents witnessed the procession and wondered what could gather so many trucks to such a formal procession. The answer is; Hope. Heart. Community. When Josh Lemire decided to create a Facebook club for truck owners, it was with a clear vision. Aptly named, Berta Boys/Berta Babes is a ‘public Facebook group’ of truck owners, where Josh’s favorite motto is shared, “If you own a truck and show respect, you are welcome!” As the group grew larger, Josh welcomed the help of his sister Tisha and a couple of friends to manage the club’s membership, its missions and Facebook presence. Josh’s vision was also that the Club be more than a friendly group of enthusiastic truck owners. It would be a, “socially-conscious club,” finding good causes to help out with and supporting individuals in dire circumstance. The membership fees would be low, allowing for the acquisition of a small or large decal to be affixed to the member truck. The artsy decals have been well-received and many local and regional trucks now display their color-matched BB membership decals. Since its inception in August 2014, the Berta Boys/Berta Babes Truck Club has grown to include 990 members as of Monday, February 22nd. Truck owners from as far as Fort McMurray and Southern Alberta gather when their schedules permit, and seemingly don’t hesitate to invest time, heart and a few bucks to support a worthy cause. When Brian Naturkach of Wetaskiwin passed away in a car crash in Brookes, Alberta in early January, the group was notified of his widow’s financial struggles, left alone with two young children. On short notice, the group presented their collective contributions to the young widow who invited them to be a part of the funeral procession. Twenty-two trucks of the BB Truck Club showed up and proudly showed their support. Wetaskiwin residents witnessed this procession and curiosity was aroused. Barry Macdonald covered this day on behalf of the Pipestone Flyer. The ‘Wheelin’ For Jordie’ fundraising mission continues on Saturday, February 28th at the Wetaskiwin Bottle Depot (4803-42 Avenue) from 10am – 2pm. Check out their Facebook page and Jordie’s www.Gofundme.com fundraising page. Bottles and cash donations will be gratefully accepted to help this young man’s family get the added mobility he richly deserves. Community support and compassionate hearts will prevail. 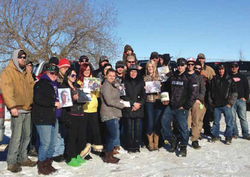 Pictured: A large group of friends and BB members offer a contribution to Jordan Miller’s mother in Wetaskiwin last Saturday. Submitted photo.